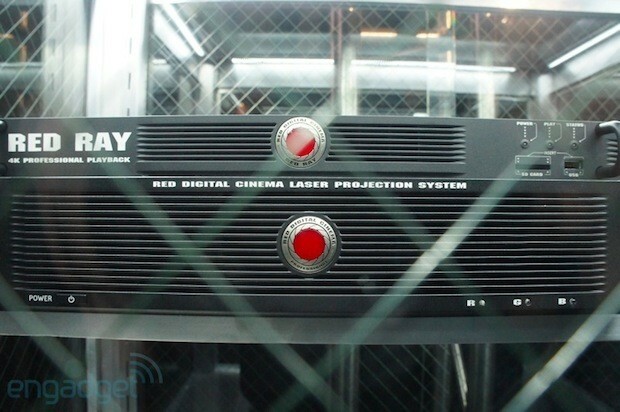 We got a peek at Red's Redray 4K Cinema Player and Projector back in April at NAB, but now you can bring the player portion of it to your own home very soon. You'll need to bring your own 4K Ultra HD display (LG and Sony would be more than happy to provide one if you have $17k+ to spare), but for $1,450 you can pre-order a unit capable of native 4,096 × 2,160 or 3,840 x 2,160 video playback (in .RED file format) and upscaling, which will ship in volume in Q1 2013. It connects to 4K displays via one HDMI 1.4 port or 4 HDMI 1.3 ports, with an additional HDMI jack needed to push 7.1 audio. It's even ready for the new high framerate 3D video that we'll see debut at theaters next week with The Hobbit. To get content home, Red is also launching its Odemax.com distribution network, which it calls the "only comprehensive distribution solution for 4K," with built-in DRM, sales and analytics tools. Written by Hasloo Network staff.